On Sale Now! 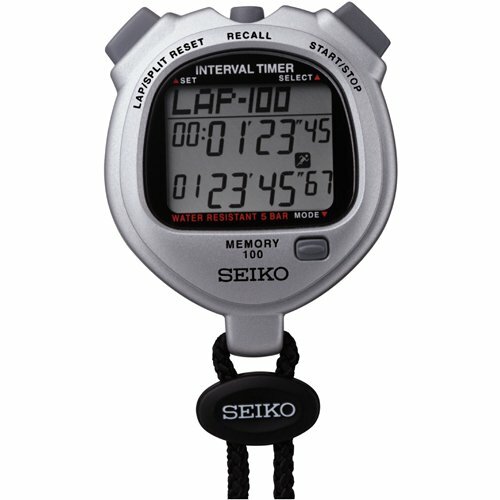 Save 6% on the Seiko Timers 100 Lap Memory Stopwatch for Interval Training by Seiko at Cardio Fitness Plus. MPN: S057. Hurry! Limited time offer. Offer valid only while supplies last. Lithium battery. Water resistant. Battery life indicator. On/off confirmation sound. Automatic shut-off function. 2 Channel countdown timer. Lithium battery. Water resistant. Battery life indicator. On/off confirmation sound. Automatic shut-off function. 2 Channel countdown timer. Split/lap time measurement. Memory recall during operation. Time and full automatic calendar. Store and recall of up to 10 split/lap times. Each channel can be preset for up to 100 hours. Measurable up to 100 hours in 1/100 of a second. Separate displays for split and lap time measurements. 1-Year warranty. If you have any questions about this product by Seiko, contact us by completing and submitting the form below. If you are looking for a specif part number, please include it with your message.